In recent years students from more than 90 Kansas City area schools representing 16 school districts have participated in International Walk to School Day. We share these examples of local activities to give you inspiration for your own event. 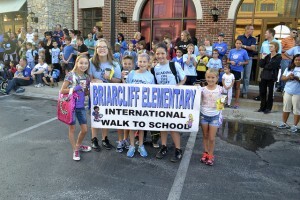 Briarcliff Elementary in the North Kansas City School District led a walk up the parkway to the school. The students were joined by the North Kansas City High School marching band, cheer squad, color guard and residents of the Briarcliff community. Latte Land handed out free hot chocolate and the Kansas City Police Department North Patrol Division provided escorts service. Santa Fe Trail Elementary in the Shawnee Mission School District gave out blinky lights and blue glow sticks. They gave away maps and pledge cards to kids and parents. Those who returned the pledge cards were entered in a contest to receive a $5 gift card to Sheridan’s. They promoted the event in the school newsletter and included the fliers on the front doors and in the lobby. They also included a flier reminder in the backpacks and sent a text message reminder the day before. Parents at Highland Park Elementary School in Lee’s Summit walked with their children to school and the PTA handed out water and breakfast bars to students. Hazel Grove Elementary in the Kansas City, KS USD 500 uses the Walking Wednesday program to promote walking to school all year long. 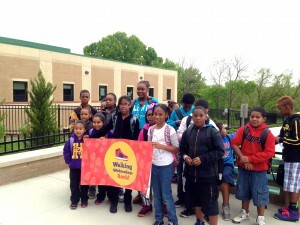 Kids who walk to school on Wednesdays can receive stickers and other incentive items. Parent champions and volunteers help organize walking routes. 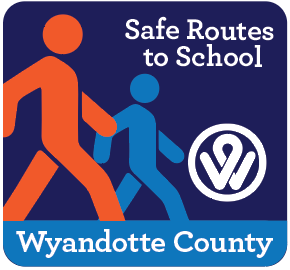 The school hosts Walking School Bus training, includes Safe Routes to School information parent gatherings throughout the school year, and uses backpack mail to community with parents. Students at Brookridge in the Shawnee Mission School District worked toward a common goal. If 365 students or more participated, students would earn an extra recess.